Passion Spas USA Blog - Swim Spas: Are You Ready for the Next Big Industry Trend? Warmer weather means that business is about to get really busy for spa professionals. Do you feel ready? Perhaps you've noticed (as we have) that swim spas are becoming increasingly popular. After all, they do provide the best of both worlds - a place of relaxation and fitness bundled into one affordable option. And includes Current-lift technology that can control a swimmer's buoyancy! In other words, whoever you are, however young or old, a swim spa, like the Spirit, has something to offer. The Spirit is just one option from our fully-featured lineup of fitness spas, and we know you might want to try just one to start out with. No problem. Spring is here; it's time to get ready for your peak selling season, and we're here to help! 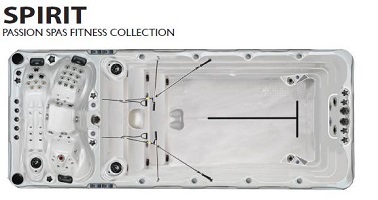 Passion Spas also has a complete collection of personal spas noted for their tempting design, satisfying value, and standard features.